With the release of Angular 4, the general syntax of Angular Animations didn’t change. However, the animation functions were moved into their own package and you now also need to add a special module to your imports array in the AppModule. Angular comes with a built-in animation module. It is hard to handle transition animation with only CSS in cases of render items in a list or conditional display of DOM elements . Thats why Angular provides this module. We will define states from where the transition will start and will end to. We will change the box from red to blue and move it to the right on the click of Animate button. We will add now a transition between the two states, in one direction and in the reverse. Wit transition we define animation from one state to other and the duration as an argument of animate method (in milliseconds). Now we can insert in-between animations. For instance , lets put an animation to border-radius 50px. To avoid hard step at the end we will add another animate method to transition to the end state. Regarding the cases of adding / deleting items in a list we can animate those actions with the void state. Let animate adding items by making the new items coming from the left and setting opacity from 0 to 1. We don’t bind any variable of state in this case to the trigger. 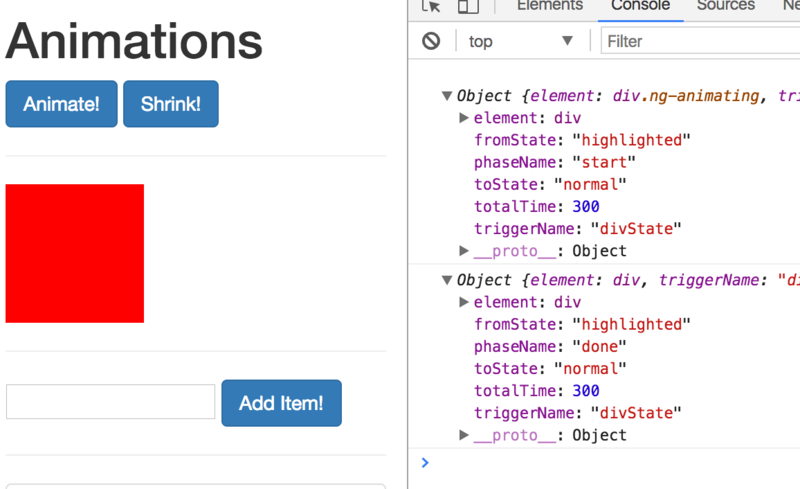 We will use predefined internal states for lists. ‘void’ state is the state for elements to be added. In case we want to set animations during the transition in specific steps we use keyframes. Defining multiple animate methods in a array will execute sequentially.